Parents are invited to enjoy a night out without their kids! Drop kids off for an evening of crafts, games, dinner, and a movie while grown-ups do whatever they’d like for a few hours. Drop off and pick up anytime within the 4-9 pm timeframe – whatever fits your family schedule. Friends welcome! This is a fundraiser for The Leukemia & Lymphoma Society. We ask that you donate to LLS the amount you would normally pay a babysitter for the night. Donations will benefit the Student of the Year fundraising campaign of Cancer Survivor and Culver City HS Student Eva Hooten, who has set a goal of raising $100,000 in 7 weeks to aid in cancer research and patient advocacy. Read more about her story at www.bit.ly/ehooten. 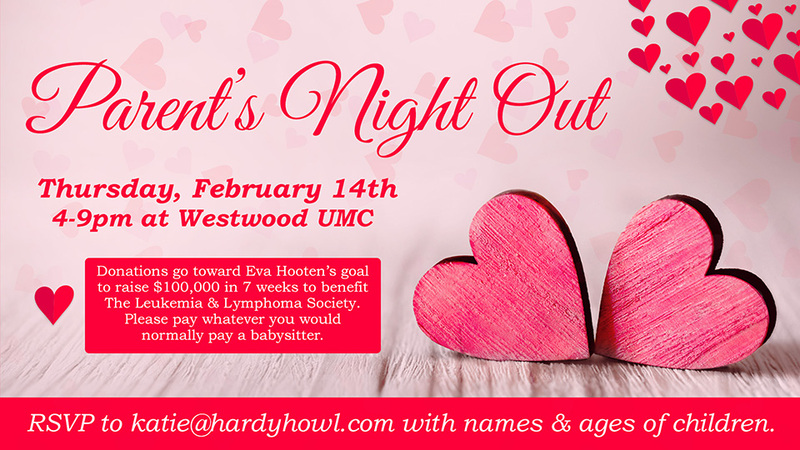 Please RSVP to katie@hardyhowl.com with names and ages of children.